Global Environmental Change: Human and Policy Dimensions is an international, interdisciplinary journal spanning the social and natural sciences. 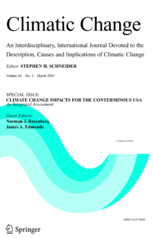 It publishes high-quality original theoretical and applied research and review articles across the entire field of global environmental change. An ever changing global system defines the scientific and social problems and issues of our time. The majority of these problems clearly cross traditional scientific boundaries. The objective of the journal Global and Planetary Change is to achieve a multidisciplinary view of the causes, processes and limits of variability in planetary change. Climatic Change is dedicated to the totality of the problem of climatic variability and change - its descriptions, causes, implications and interactions among these. The purpose of the journal is to provide a means of exchange among those working in different disciplines on problems related to climatic variations. 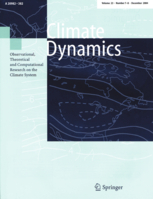 The international journal Climate Dynamics provides for the publication of high-quality research on all aspects of the dynamics of the global climate system.